A movie about these ideas could, in theory, be grounds for a thoughtful satire or farce. They do not, however, make for a very good or compelling childhood adventure, especially after “Wreck-It Ralph” and “Inside Out” – two movies this one rips off – have already left behind their resonant insights. What remains in their shadows is a movie as thin as the premise that moves it, a shoddy assault of color and sound that plays as if it were written entirely in text message between people with the attention span of fruit flies. Yet as I watched it, something more foreboding seemed willing to lurk in the periphery of my thoughts: in many ways, this is the biproduct of people who have assumed the worst of people and have reduced the human ideal to a passage of cynical rituals and mean-spirited exchanges. You know you are in the middle of something cynical when the most interesting character in a cartoon is a walking digital hand whining about no longer being popular. Let me set the scene for you. The movie takes place almost entirely on the circuit board of a smart phone belonging to a teenage boy, who is frequently seen using his device to, I guess, flirt with a girl sitting in front of him in class. We are constantly reminded that this routine is normal process for today’s teenagers – they harbor a sense of awkwardness that is more easily cloaked behind a phone’s screen, which is used to send emojis back and forth to suggest one another’s mood of the moment. Then we meet the emojis themselves, which include Gene (T.J. Miller), whose sole emotion is supposed to resemble a grimace (a “meh,” more specifically), and Hi-5 (James Corden), who is shaped like – you guessed it! – an open palm. They are friends united by their need to experience something outside the norm but are held back by the rigorous structure of their culture, which demands all emojis possess a single expression, lest they confuse or bewilder the people using them to communicate. The most staunch defender of this routine is Smiler (Maya Rudolph), the most sickeningly happy emoji in all of Textopolis, who enforces the trend like an overseer of totalitarian government. When Gene is seen panicking in his cell at a key moment of use, however, it sends a strange image to the phone that is baffling, leading its owner to suspect something wrong with his electronic device. Smiler perceives this as an outright threat to the stability of their world, and she dispatches giant robotic soldiers out to erase him from the data. Not taking kindly to this threat, Gene and Hi-5 leave Textopolis in search of a hacker who might be willing to program them into conformists, which leads them to the company of Jailbreak (Anna Farris), a renegade emoji on a mission to flee the phone and enter the cloud, where she can be safe from those inconvenient device reboots. Smart move. Unfortunately for her, she is unknowingly saddled with company of two sidekicks whose personalities are measured by immature one-liners or ridiculous double-entendres. Somehow, someway, she sees something endearing enough in Gene to be attracted to him – what that exactly is, I dare not wonder, lest I get into figuring out the bizarre mating habits of talking cellphone images. What is consistent here is the simplicity of the journey. Nothing deep or meaningful happens to them. It can’t, because to have something more than just a surface exchange implies there is more to an emoji than meets the eye. But by making an animated film about this subject, without any of the elaborate twists or underlying psychology that works well in the Pixar yarns, the filmmakers have enacted an ironic case of self-fulfilling prophecy. 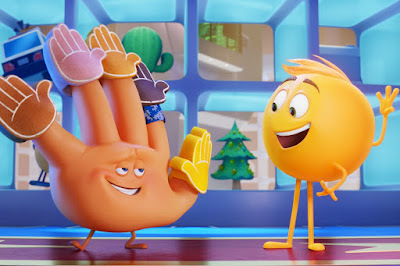 These are characters too dimwitted or simple to sustain a movie, and their adventures move with all the rhythm of a Saturday morning serial, where everything can be surmised by simple minds in the first ten minutes. Younger kids might be wowed by the color or even amused by the humor, but it will speak nothing to their imaginations; everything functions without much sense of enthusiasm to do more than the status quo. In the era of high-pitched enthusiasts working at the controls of most cartoons, what is the use of that? The motivation is a depressing one: the studio wants your money and offers you nothing more than 90 minutes of meaningless movement in exchange. The greater offense reveals itself almost accidentally. Towards the end, after the three leads have wandered from one boring realm to the next searching for an app that will take them to the cloud, they are caught in a situation where they must convince the phone user that he is, in fact, not experiencing a malfunction, but is dealing with something that ought to be preserved. The phone is just mere seconds away from being wiped clean, emojis are disappearing into thin air, and Gene steps up to – get this – create an animation that will call to attention his sense of individuality. The problem is that the owner misses the moment, and it is only seen in periphery by a nearby friend, who whisks the phone away from the plug that will format it. What’s the point of having a human character at all if you intend to violate the possibility of him having an important epiphany? What does it do for his sense of motivation? This is a movie that knows what sources to intimidate but forgets their key lessons at all the pivotal moments.